1. 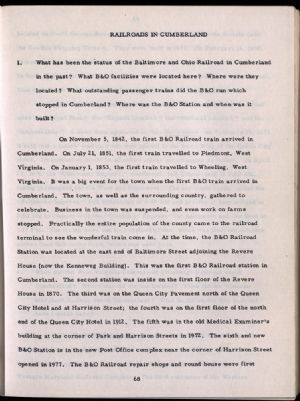 What has been the status of the Baltimore and Ohio Railroad in Cumberland in the past? What B&O facilities were located here? Where were they located? What outstanding passenger trains did the B&O run which stopped in Cumberland? Where was the B&O Station and when was it built?